You hear the clang of the bell and you move out of your corner towards your opponent. Peering through your guard you inch closer to striking range as you reach the center of the ring. Your muscles are tense and you're ready to strike like a snake at the first sign of an opening. You're intent on finding the opportunity to start the six punch combination you've been working on in the gym over the last few weeks. Finally your mind registers a weakness in your opponent's defense and before you can think about it your jab fires out triggering the start of your combination. Your jab strikes out with blistering speed but you're not even thinking about it anymore - you've already moved onto punch two in the combination - the straight right. Your weight begins to shift and then....whack... you get smoked up side the head with your opponent's right as it crossed over your jab. Before you can figure out what's going on....whack....your head is snapped to your left as your opponent lands a left hook....whack....a straight right sends you reeling backwards. Wait a second weren't you the one with the initiative. Weren't you the aggressor - the attacker - in control of the fight? In the first part of this two part boxing combinations series I did a lot of talking about throwing boxing combinations. Ask a boxer to describe boxing combinations and most will start listing the offensive combinations he or she likes to use in a fight. Rarely, if ever, will the boxer start listing a series of defensive moves, blocks, slips and parries used to nullify an attacker's offense. This aspect of defensive combinations is equally as important unless you enjoy getting hit in the head. Combinations flow. Each punch sets up the next one with the correct transfer of weight. Combinations are stable. You keep it tight and should not have to move your feet (much) - everything is in perfect balance. But there is one concept that changes and it's related to flow. With an offensive combination - once you initiate the combo you follow through to completion. If one punch doesn't land there's still hope for the remaining punches in the combination. A defensive combination is used only to the point where you nullify the attack. At any point in the combination - if there is an opportunity to go back onto the offense - you take it. In reality you'll find it nearly impossible to disrupt a defensive combination once you start it. If it's instinct you'll likely finish the entire combination before your mind has a chance to stop it - but in an ideal world - you will instantly seize the initiative when the opportunity presents itself. What's this initiative you keep talking about? In combat the person who controls the battle has the initiative. He or she is free to make decisions on how the battle will proceed and forces adversaries into a defensive, reactionary posture. You want the initiative and you want to maintain it for the duration of the fight. There are sometimes points in the battle where neither you nor your opponent has the initiative or it is traded back and forth with lightning speed. In the ring, one of those times is at the start of the bell. At that point initiative is sitting in the middle of the ring between you and your opponent. It's a race to get there and grab it. Once you have it you hold onto it with everything you've got. You want to be in control. You want to be making the decisions as to how the battle will proceed. Being at the whim of your opponent and reacting to what they are doing is no way to win a fight. In fact you can't win from a defensive, reactionary posture. You have to have an offense. The triggers I talked about in part one are even more important when you're on the defense. Every incoming punch requires an instant defensive combination response and every defensive combination is followed by an offensive combination to help you re-take the initiative. If you get hit with a jab your reaction should be instant and immediate to nullify the remainder of your opponent's combination. You must remember to expect to get hit with a flurry of punches - never just one - so if you just got hit with a jab, something else is already following it and you need to do something about that. Ideally, you're going to counter the jab before it hits you and maintain the initiative, but if you give the initiative to your opponent you have to defend until you can take it back. At the point where you do take it back, you enter a transitional stage of the battle - where you aim to change from defense back to offense - and hopefully remain in that state as long as possible. If you've been around a boxing ring long enough you'll see times where one of the boxers gets hit, covers up, and continues to get hit. They simply do not know what to do. They are frozen in a state of indecision and are paying the price because they have not drilled a defensive combination response to what is happening. By contrast you'll see some boxers that get hit and immediately they are bobbing and weaving, ducking, slipping, moving regardless of whether punches are being thrown at them or not. Those boxers are running through a defensive combination designed for that situation. Now this whole concept of defensive boxing combinations is not as intuitive as being told to throw a 1-2-3 combination so let's run through a simple example. Consider that you're an orthodox fighter fighting and orthodox fighter. If your opponent leads with a jab you can be fairly certain that the next punch is going to be another jab or a straight right. If they connect with that first punch they are expecting your head to come back to a certain position. Instead, you rock to the left (inside) and let the straight right or second jab fly over your right shoulder. Without thinking you now bob and weave back to the right as their next punch (likely a left hook) flies harmlessly over your head. As you come up you throw your own jab which connects and triggers the start of your own combination. You're back in control. So that defensive combination is a Left Slip, Bob and Weave Right followed by a 1 to transition back to the offense. What would have happened if you did not immediately initiate the left slip off the trigger of getting hit by the jab? Your head would have remained in the same place and eaten the straight right followed by the left hook. I hope you're hungry. Recap of Punch Numbering. B following a number refers to body shot. We just covered this one. Getting hit with a straight punch from your opponent's lead hand is the trigger to slip left, bob and weave right and throw a 1 to transition back to the offense. Getting hit with your opponent's rear hand is the trigger to immediately cover the right side of your body/head (expect the 3), duck and pivot right to nullify any power in the 3 and come up with a 4 to body or head to transition back to offense. 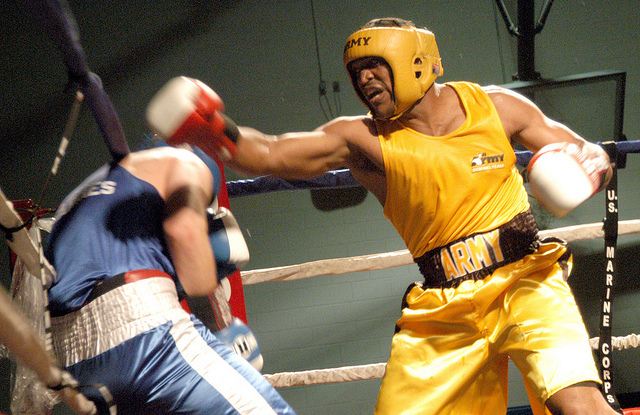 Getting hit with a left hook means a straight right (or right hook) is incoming. Step and pivot forward left (yes - towards the punch) and immediately throw your own left hook as you pivot, bob and weave right, 1 to transition back to offense. A word of caution - these aren't always going to work as planned or look pretty. Timing may be off slightly or you may receive glancing blows - but the key is to do something on the first punch that connects to limit any damage the rest of the combination can inflict. It would not hurt to add additional generic defensive movement to any of these defensive combinations to keep your head moving and confuse your opponent. Putting a couple extra left, right slips or bobs and weaves, blocks, parries, etc... onto any defensive combination or using them as your go to response to any hit won't hurt and is better than freezing and doing nothing. Like him or hate him - Floyd Mayweather Jr is one hell of a defensive fighter. Have a look at this video and see if you can pick out some more defensive combinations to add to your game. Now get in the gym and practice. Boxon. Not get in the gym and practice. Boxon.